Sitting around a table together and sharing a selection of mezes (small dishes similar to tapas in Spain) is an integral part of Turkish gastronomy, so for an authentic Turkish dining experience, we always serve four different mezes as the first course during dinner at Mandarin & Mango Boutique Hotels. A while ago, we started including a couple of recipes with each edition of our email-newsletter, to enable our guests to recreate some of their favourites back home. These have become such a popular feature that we have decided to collect them on this page. Why not invite some friends round, pick between 6 and 12 dishes to try out, and serve with warmed flat bread. We have also included a couple of desserts at the end of the page for those with a sweet tooth. Place the bulgur wheat in a bowl, cover with boiling water and leave to soak until the water has been absorbed. Drain off any excess water. With a pointed knife, make a small cross-cut through the tomato skin. Blanch the tomato in boiling water for a few seconds, then dry it and peel off the skin. Finely chop the tomato. Add the chopped tomato, walnuts and herbs to the bulgur wheat. Combine the oil, lemon juice and salt to make a dressing and stir into the bulgur mixture. Wash and dry the cucumbers and cut them in half lengthways. Using the tip of a teaspoon remove all the seeds. 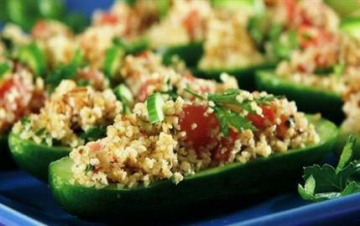 Fill the cucumber boats with the bulgur mixture and serve. With a sharp knife, partially peel the skin of 5 aubergines to achieve a stripy pattern, immerse them in salted water for approx 15-20 min, then rinse, dry and cut in half lengthways. Retaining half a cup of olive oil, heat the remainder and fry the halved aubergines until cooked. Drain and remove excess oil with paper towels. 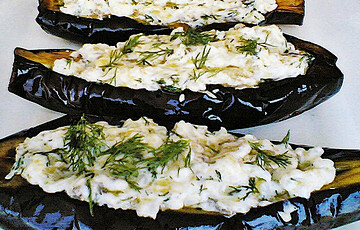 Cook the remaining 3 aubergines under the grill, allowing the skins to char. Remove the charred skin, and chop the flesh into cubes. Blend these with the remaining ingredients and spoon the mixture onto the cooled aubergine halves. Briefly soak the stale bread in water to soften, then squeeze to remove any excess moisture. 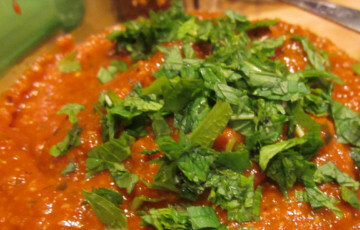 Mix all the ingredients in a blender and serve on a small plate decorated with flat leaf parsley. 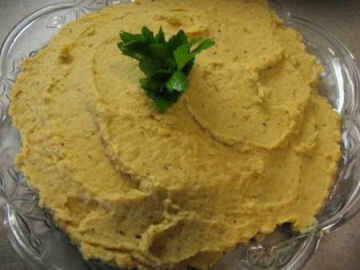 If you are unable to find red pepper paste, substitute with two roasted red peppers, skins removed. Wash and grate the courgettes, sprinkle with salt and leave to drain in a colander. In the meantime, finely chop the spring onions, parsley and dill. Heat the oil in a frying pan and gently fry the spring onions. After a minute, add the courgettes and fry until they begin to soften. Add the rice and just enough water to cover and simmer gently. Just before the rice is cooked and the water is absorbed, add the herbs. Once all the water has been absorbed, leave to cool. Crush the garlic and blend with the yoghurt. Stir into the cooled courgette mixture and season with salt. Just before serving, pour over melted butter and sprinkle with paprika. In a large bowl, cover the bulgur wheat with the boiling water, cover with a lid and leave to soak for 30 minutes until all the liquid has been absorbed. Mash the potatoes to a smooth puree, and stir in the bulgur wheat, soft butter, chopped parsley and spring onions, lemon juice and spices. Dip your hands into water and using your palms, form the mixture into oblong, walnut size balls. Arrange on a plate and drizzle with olive oil to serve. Place the broad beans in a saucepan of water and leave to soak overnight. Drain and rinse, then cover with fresh water and bring to the boil. Simmer for 1 hour and 15 minutes, or until soft and tender. Drain the beans, keeping the cooking water to one side. Place the beans in a food processor/blender, add the olive oil, vinegar, finely chopped garlic, seasoning and 4 tbsp of the cooking water. Blend in short bursts until the right colour and consistency are achieved, being careful not to over-blend (over-blending causes the mixture to harden and darken; if this happens, add more water and blend in gently). 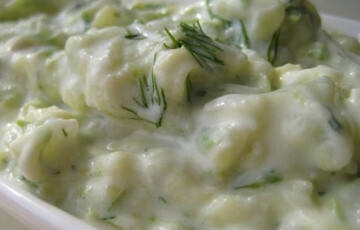 Adjust the seasoning if necessary and serve in a bowl, garnished with chopped dill. In a large pan, soak the bulgur wheat in the boiling water until all the liquid has been absorbed. Chop the parsley and spring onion, setting some aside for decoration. Crush the garlic. Mix all the ingredients together and blend to a puree. 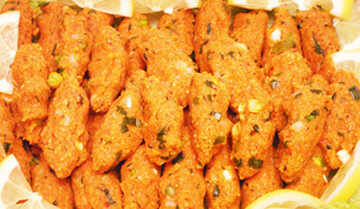 Take tablespoon-size amounts of the mixture, squeeze in your hands to remove any excess moisture and shape into kofte. 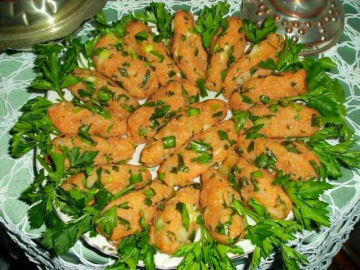 Place on a tray or serving dish and sprinkle with the remaining herbs. Serve cold. Finely chop the carrots and potatoes and boil together with the peas until softened. Soak the rice in lukewarm water. Drain both the rice and the vegetables. Heat the butter frying pan and gently fry the vegetables and rice for 5 minutes. Add the 5 cups of water, salt and pepper and simmer gently until the rice has absorbed all the water. Divide the filo pastry into four; use each portion to line the base of a soup bowl. 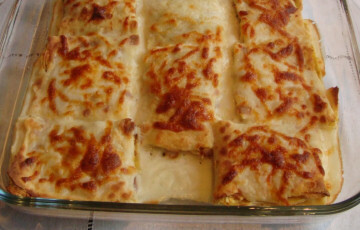 Mix the egg yolk with the milk and brush the filo pastry with the mixture. 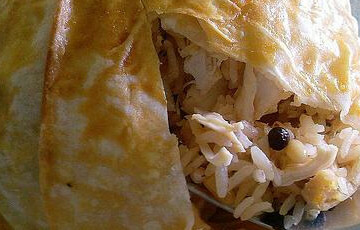 Divide the vegetable rice between the four bowls, and use fold over the edges of the pastry to close the pies. Turn the bowls upside down onto a greased baking tray and bake in a hot oven for 10 minutes or until the pastry is golden and crispy. Cut the aubergines and courgettes into chunks, chop the onion and fry together in the olive oil. Add the chopped onion, peas and seasoning and heat for another 3 minutes. Beat all the crepe ingredients to a smooth batter and fry a little of the mixture at a time in a non-stick pan on both sides (each pancakes should be very thin). Melt the butter in a saucepan, stir in the flour to make a roux. Gradually add the milk and simmer gently until thickened, stirring constantly. Divide the vegetable mix evenly between the pancakes, roll them up and place in an oven-proof dish. Pour over the sauce and sprinkle on the grated cheese. Bake in the oven until the cheese starts to brown. Serve hot!